It was supposed to have an eight-foot plastic-covered cable with a 120db alarm. All for ONLY $9.99 each, plus shipping. How could you go wrong with that? I was in for five: two for a buddy at work, one for me and one for each of my two sons. It all came to $59.94. Graveyard Mall doesn’t have the fastest shipping, so I had almost forgotten that I had ordered the things when a big box showed up. I ripped it open to find the locks safely protected in those blister packs that cut you all to pieces while you’re trying to extract the innards. 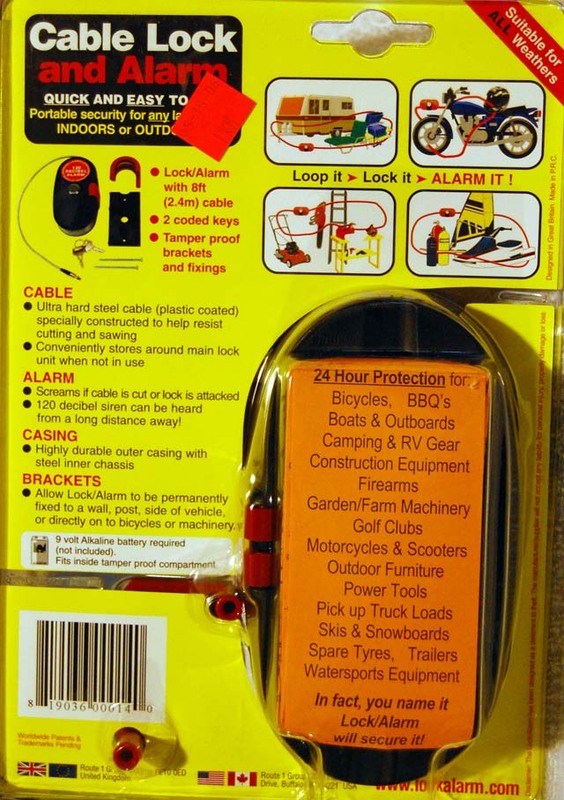 The front of the package promises that the lock will scream when cable is cut. The back is equally persuasive. That eight-foot cable looks like it’ll go around everything you own, if you believe the pictures. Oops. looks like the 9-volt battery to make it work isn’t included. Go dig around for a battery. Unwrap the cable, stick it in a hole in the front and turn on the key. Wiggle cable around. The only catch is that it doesn’t take much wiggling to make it sound off. Wind swinging it around would be enough to do it. What makes it work and how secure is it? 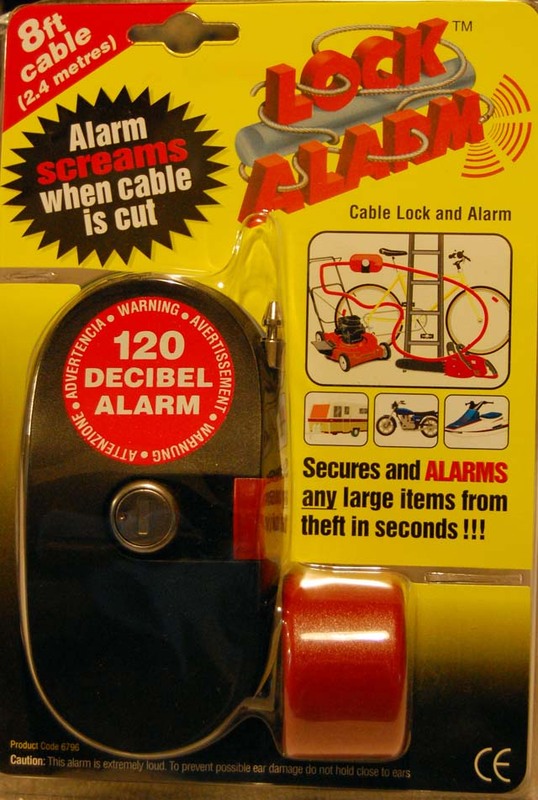 Well, to be honest, the most effective part of the lock is the big sticker on the front that says 120 Decibel Alarm because the cable would be easy to cut and it wouldn’t take much to pull it out from behind the light-weight hook that holds it to the body of the device. The alarm sounds if the metal pin at the end of the cable pulls away from a contact. 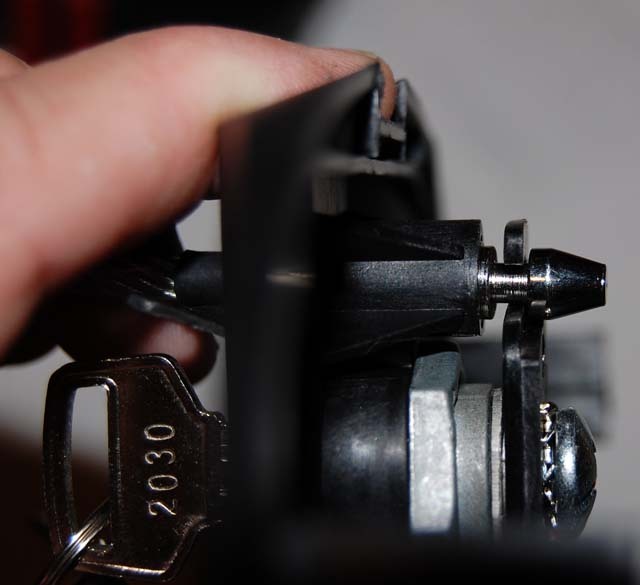 The device is bulky, the cable is wrapped around the body of the lock and secured with a clip and it’s easily ripped apart. The alarm WOULD sound, but I’d be way down the road by the time you heard it go off. 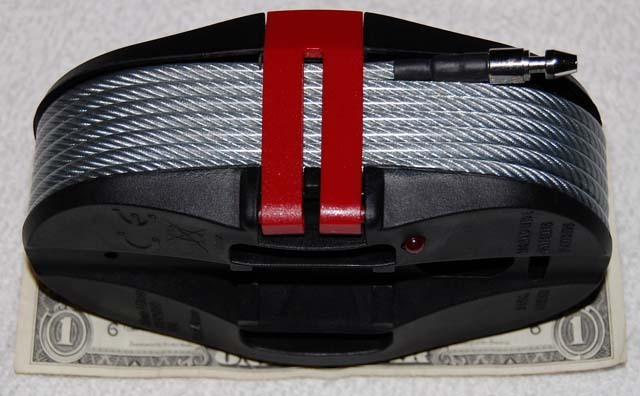 And, once the cable is pulled out from behind the flimsy plastic hook, you could unwrap it from around the item like pulling a belt out of a pair of pants. You can get a sense of the size by looking at the dollar bill in the background. Graveyard Mall gave me an RMA to return the locks, but I see in the fine print that they’ll only refund my money if the package is unopened. If it’s defective, they’ll only replace it with a like item. I would consider the whole design concept defective, but getting a new one won’t solve that problem. Anybody out there want this one? I’ll ship it to the first person who’s interested for the cost of postage. Here’s an update: a check from Graveyard Mall showed up in the mail this week. They gave me a refund for $49.95. That meant that they didn’t give me credit for the one that was opened, didn’t return it and stuck me with postage. I guess I should be happy to have gotten the $49.95 back. any chance you still have this? would still like to give it a try. 49649 michigan. tks! I’d send it to you, but I don’t have it. I returned all of the Lock Alarms. I got credit for the unopened ones, but they didn’t give me credit for the one that was opened, they didn’t return it and they stuck me with postage. I would avoid doing business with this company. Trust me, you wouldn’t have wanted it. It would have been a waste of my time to mail it, a waste of resources to deliver it, a waste of your time to discover what I’d already found and it would have ended up yet another object in the landfill. Pretty well made and the sensor mechanism works pretty good. IIRC it was around $35 with shipping? This looks like a great idea at first. My son rides bike to school and this would be good. Not so sure now after reading some of the reviews. Doesnt sound like its easy to get your money back either.